9 roses symbolizes eternal love. I want to be with you forever. 9 roses symbolizes eternal love. "I want to be with you forever" - to send the message. "We'll be together forever," send a bouquet of nine roses to your loved one - this number in Chinese means "long" and "eternal" and use it as a lucky number to represent long life and forever. For this reason it was used in marriage ceremonies and celebrations. 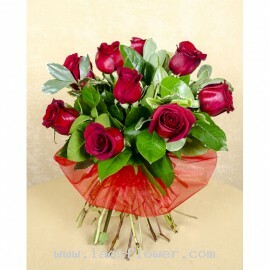 A bouquet of 9 red roses arrange in pyramidal shape accent with gypsophila. Wrapped in bright red lamy and tied with a red bow. 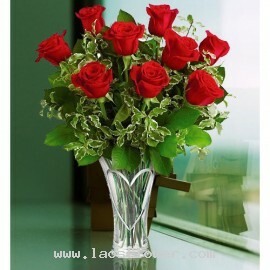 The color of roses and packaging materials can be replaced as desired. Occasionally, substitutions may be necessary to create your bouquet due to the availability of cer..
9 red roses bouquet accent with eucalyptus leaves. Wrapped in brown paper and tied with a bow. The color of the roses, paper, and ribbon can be changed. Please advise when ordering or by e-mail. Occasionally, substitutions may be necessary to create your bouquet due to the availability of certain..
A vase of 9 red roses arranged in a glass vase accents with green leaves. * If you want to change the color of the roses. Please inform in order or email us. Occasionally, substitutions may be necessary to create your bouquet due to the availability of certain flowers in various parts of the coun..
A bouquet of 9 red roses arrange in round shape wrapped with red mesh. * You can choose the color of roses as you like. Please let us know when ordering or by email. 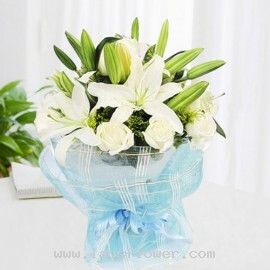 Occasionally, substitutions may be necessary to create your bouquet due to the availability of certain flowers in various parts of ..
White & Blue Bouquet consists of 9 white roses and 6 white lilies wrapped in white paper inside and wrapped in blue mesh on the outside and tied with a blue ribbon. * The color of the flowers and the materials can be changed as you want. Occasionally, substitutions may be necessary ..